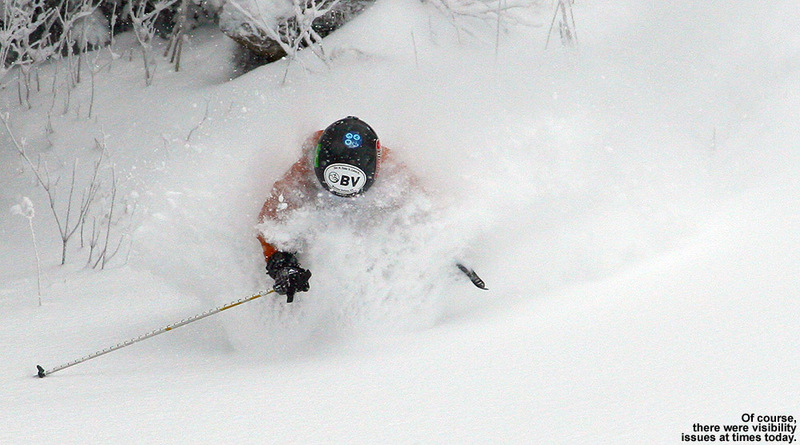 The backcountry season is definitely underway at Bolton Valley now. After our fresh snow and reprieve from cold temperatures yesterday, today it was back into the arctic air with highs predicted to be in the single digits F or even hovering around zero in the higher elevations. And of course that didn’t factor in the wind, which brought the effective temperatures down well below zero. 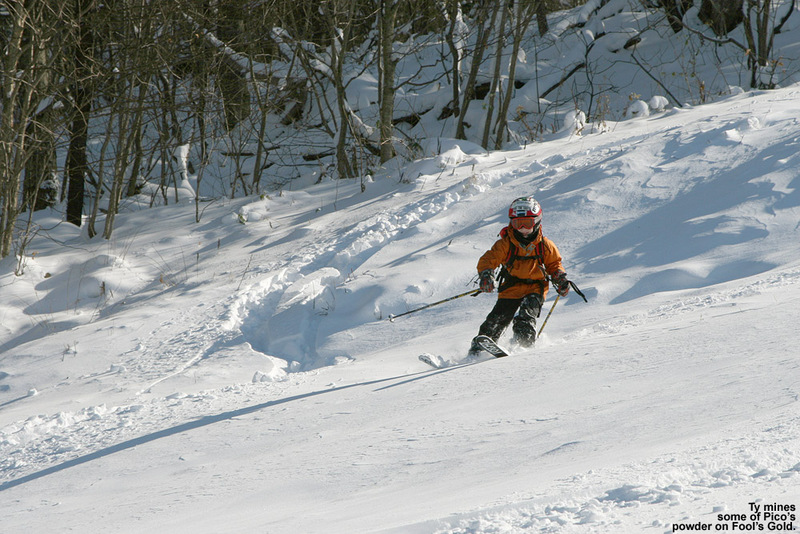 Since that was the forecast, E and Claire cancelled our BJAMS ski program at Stowe today; there’s just no reason for dozens of kids to risk frostbite, especially when many of them are so focused on learning to ski that they’re oblivious to what’s going on with their skin. With the prevailing temperatures, I wasn’t all that excited about riding ski lifts myself, but since the snow depth at the Mt. 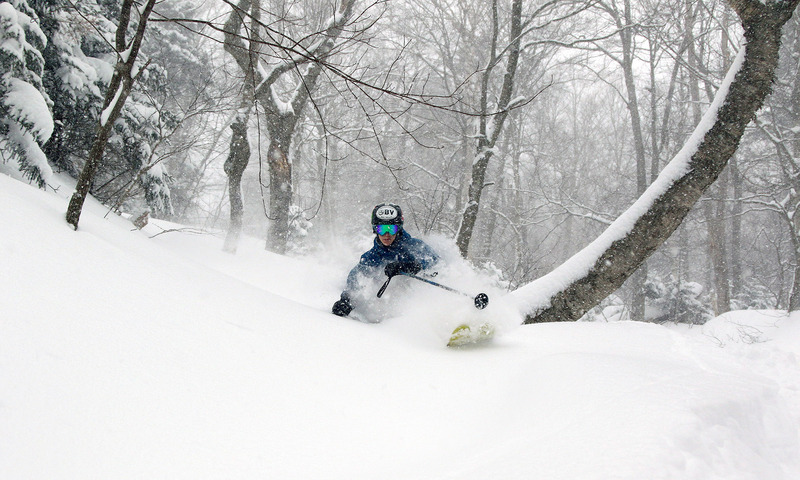 Mansfield Stake came in at 36 inches yesterday, that got me thinking about a backcountry tour on the Bolton Valley Nordic and Backcountry Network. With three feet at the stake, much of the terrain on the network should finally be in play, and I was eager to see how things were going up there with $40,000 having been invested since the state took over a large portion of the land in June. Temperatures were in the low single digits when I arrived in the Village, but as I parked down along the edge of Broadway I could see that the Nordic scene was definitely hopping. Numerous skiers swished by as I prepared my gear, including three patrollers heading off to monitor the trails. I definitely felt cold as I geared up, but once I started moving, that welcomed warmth of activity quickly came on, and I rapidly found that pleasant temperature balance between movement and winter cold. 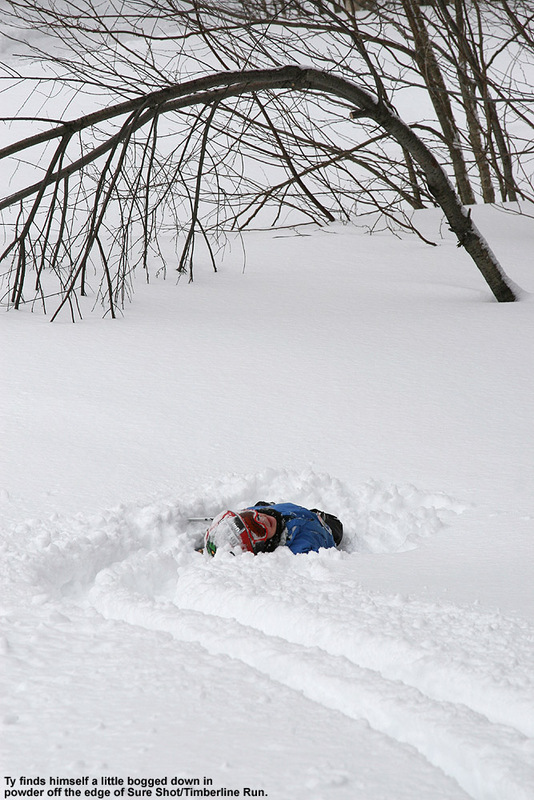 Checking the powder depth near the base of the network at ~2,100’ revealed 7 inches, which was encouraging. I started out with only a vague plan to head up to Bryant Cabin and assess the state of coverage on the trail network, so that gave me the opportunity for some exploring along the way. 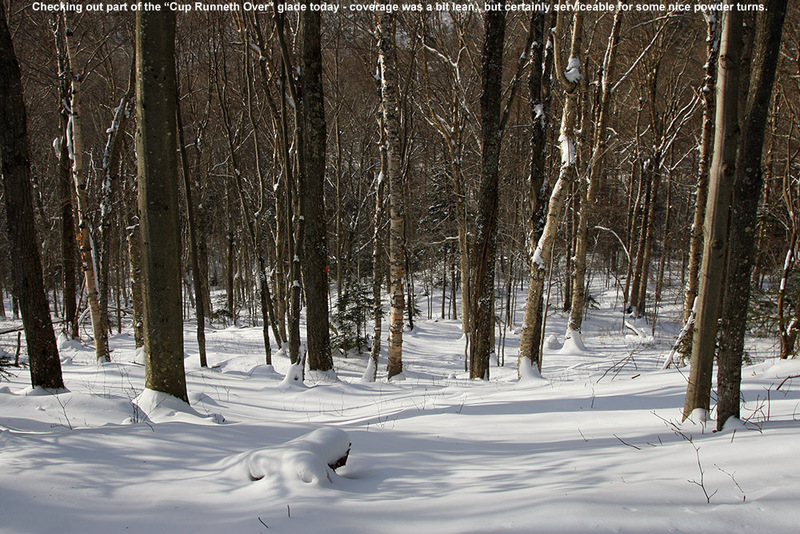 For a while I’ve wanted to check out the glade called “Cup Runneth Over”, which I’d read about a while back on the Bolton Nordic Blog, so this seemed like the perfect opportunity to do it. I had printed out Art’s directions to the glade on a piece of paper that I keep in my backcountry pack, and with the help of those and a little poking around, I quickly found it. The coverage looked a little on the lean side, but as I glanced around, I could see that not only does the glade drop below World Cup, it starts up above it – and there was a track on that upper section that clearly showed how the snow was sufficient for turns. I skinned up through that upper section of the glade until it reached the Bryant Trail, and made a mental note of that upper start point for future reference. I can’t believe how many times I’ve passed by that spot on Bryant and never noticed the glade starting off to the left, but that’s what exploring is all about. 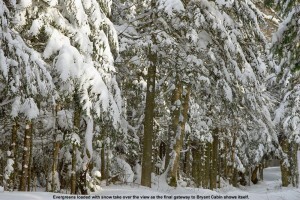 The evergreens were choked with snow today on the upper sections of the Bryant Trail. It was indeed nice to finally get to see part of Cup Runneth Over, but I wanted to keep exploring, so I merged onto Bryant and headed upward. I noticed what looked like some open trees in the forest below Possum, and did a quick tour through the area to see what it offered. 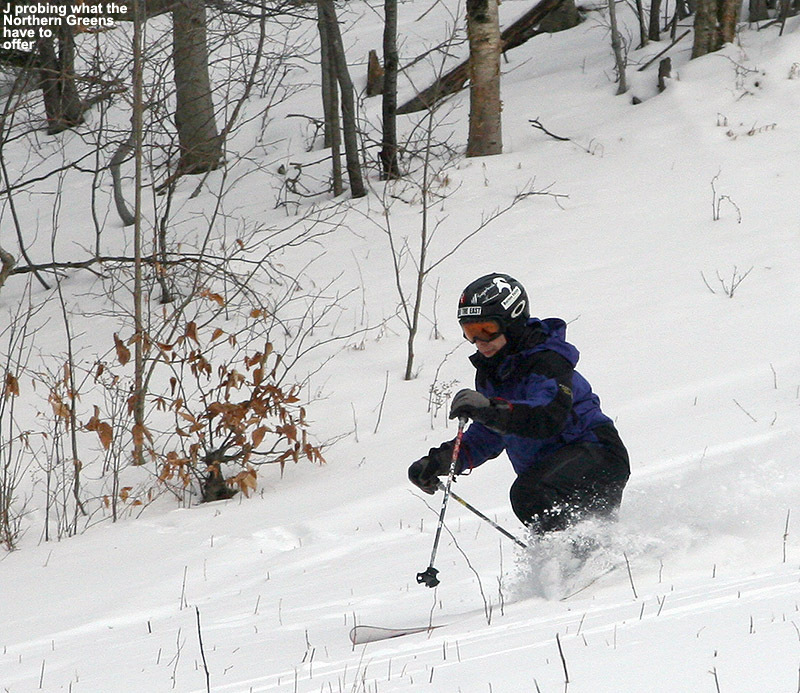 The terrain there really needs no glading, as the natural make-up of the forest would lend itself to plenty of turns. The pitch is such that it would be great after one of those events that deliver 4 to 6 inches of light powder over a smooth, firm base. 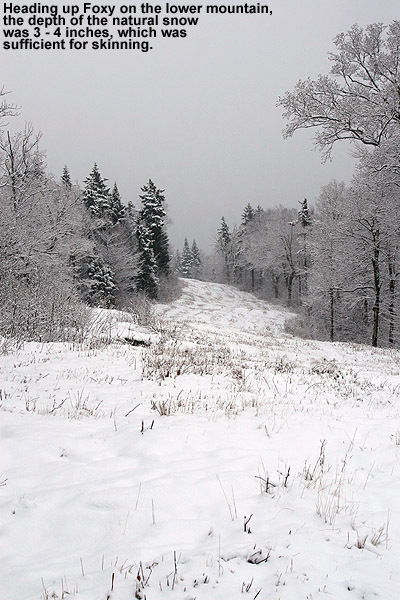 Much more than that amount of snow though, and the pitch is just not there – even today it would have been slow with the 7 or 8 inches of medium weight snow atop the snowpack, but that was also in part due to the snow being slow because of the cold temperatures. Continuing upward on Bryant, I saw tracks on fairly steep lines like A1A, JJ’s, and Big Blue, and the coverage certainly looked sufficient. 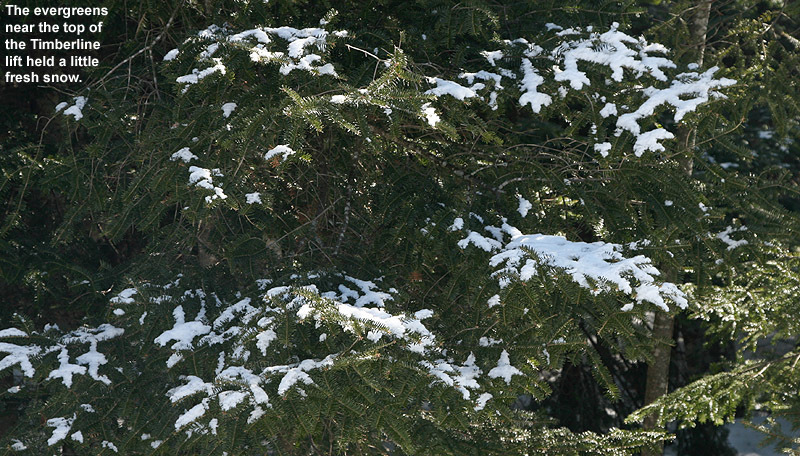 I eventually got into the areas of protected evergreens that really hold the snow, and you could see that they were choked with powder. Up at the Bryant Cabin at ~2,700’ I found the powder to be in the 8 to 9-inch range. I decided to continue my tour out along North Slope, and when I finally hit one of the local high points I stopped to take off my skins and have a break with some of the hot soup from my pack. 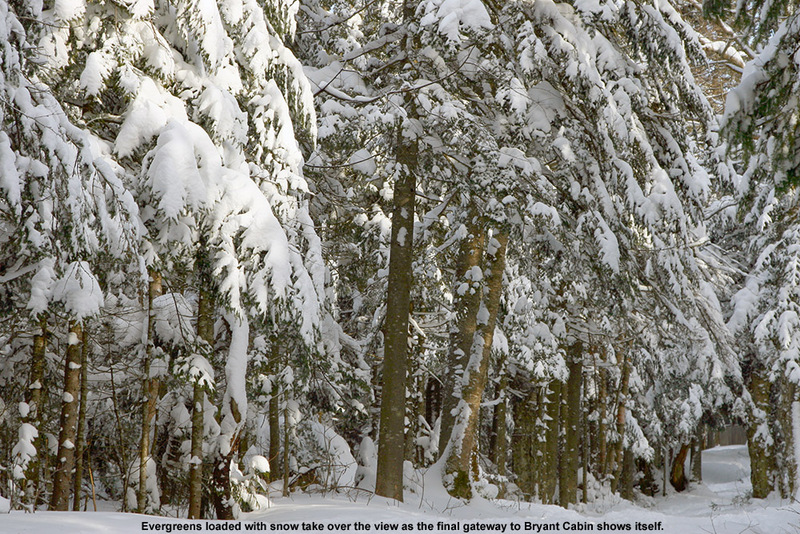 The scene was peaceful, although I could occasional hear the hoots and yelps of other skiers around on the network. I began to descend on North Slope, and actually decided to ride it all the way out to the end because I’d never done that. There are actually a couple of notable uphill sections that require a few minutes of work, but it wasn’t enough that I needed to put my skins back on. Although I saw some good potential in some of the glades, I stuck with my plan to run North Slope all the way out to Lower Turnpike and ski down there, because after yesterday’s experience, I knew it was a sure thing in terms of coverage. That actually made for quite a unique tour overall, one that brought me from the Nordic/backcountry network out to the alpine network. Most of the time I’m using the lifts and going the other direction, so this was a fun change. North Slope has a nice little connecting trail with Lower Turnpike that I’d never seen. There were only a few tracks on Lower Turnpike, so there was plenty of fresh snow, but it didn’t ski nearly as beautifully as yesterday. The snow had settled a bit more, some wind affected it in spots, and it was slow due to the cold temperatures. So while fun, it couldn’t compare to yesterday. I finished off my run with an interesting route through the Village below the Liftline Condos – it actually turned out to be a pretty slick connection with some backyard powder turns that dropped me right down onto Broadway. 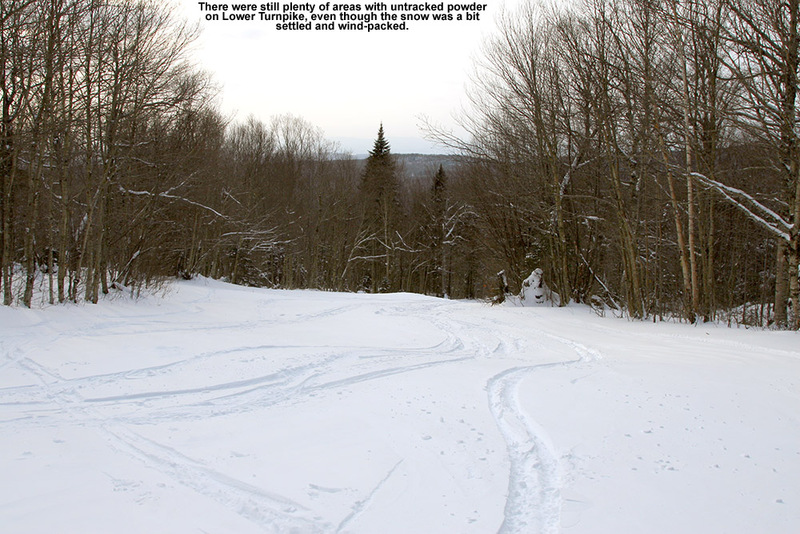 Another great discovery came this evening, when I visited the new Friends of Bolton Valley Nordic & Backcountry website while writing up my report. I checked out the map of the network that they have available, and it’s the most expansive I’ve seen yet. 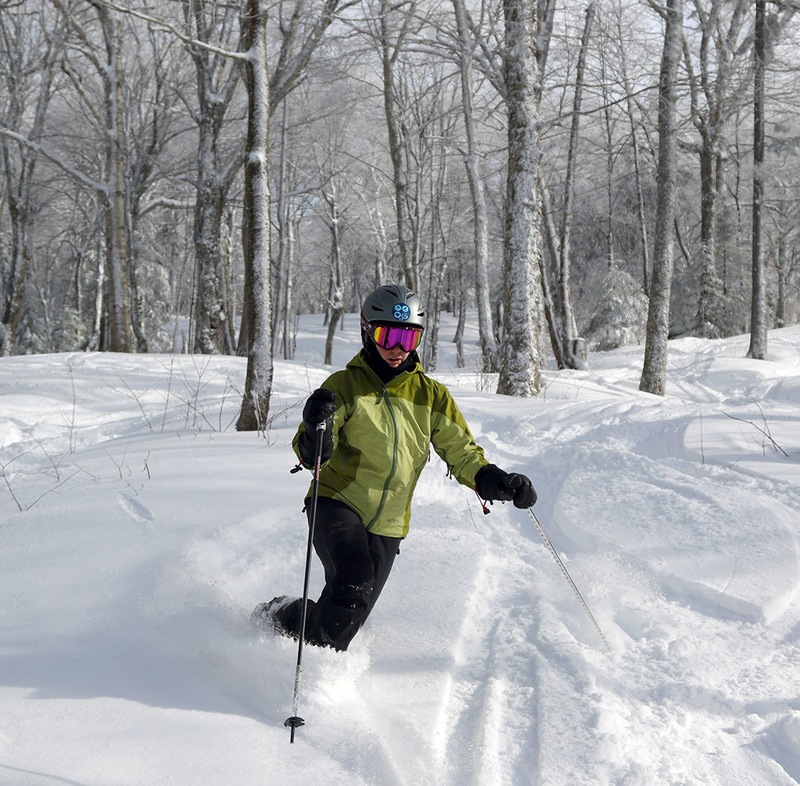 Many, many glades have been included on the latest version of the backcountry map, and there are now more than two dozen of them on there. It really gives one an idea of just how expansive the opportunities are out on the trial network, and it’s going to be great to see how things go with the new, clearly energized, participation in maintaining the area. 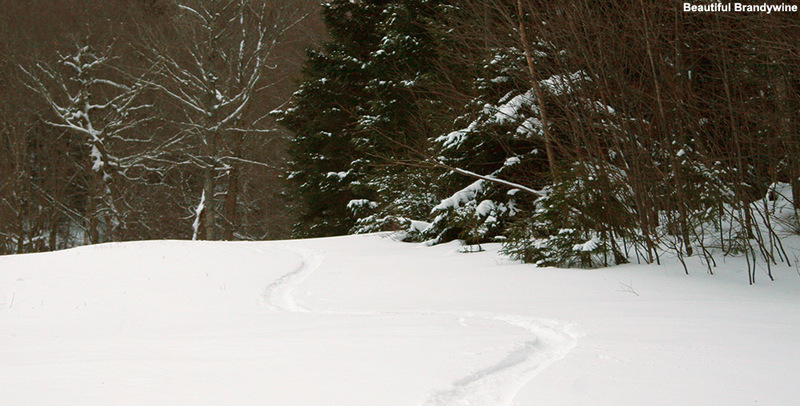 As for the trails, everything I saw today looked to be in excellent condition. And, with the snowpack below average for this point in the season and just getting to sufficient levels for backcountry skiing, I’d expect that problems would be relatively easy to see. Thanks to all the folks that worked on the trials this season, and put out that great new map of the backcountry network! 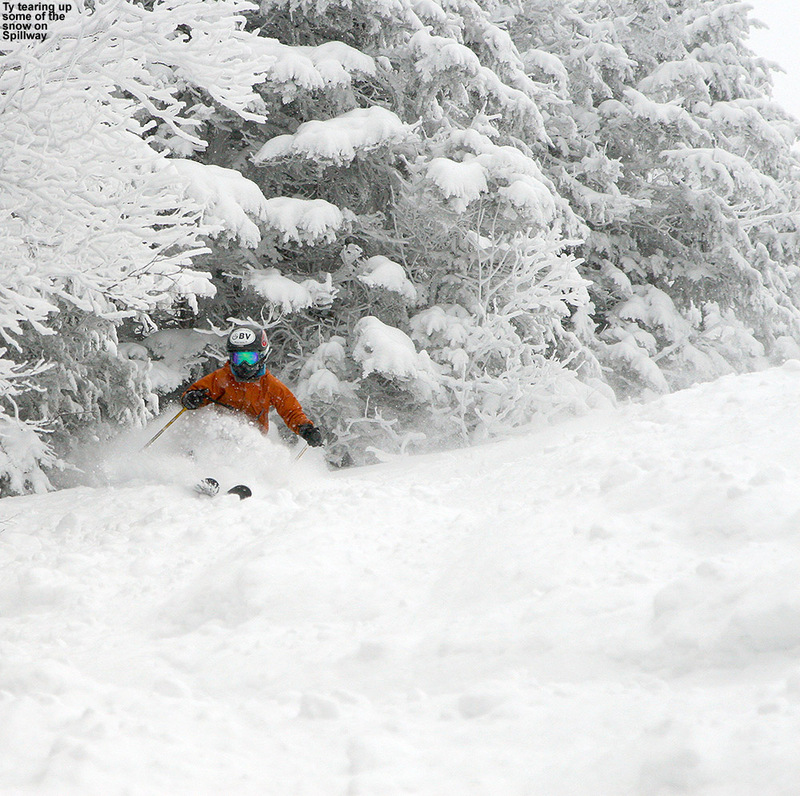 Another Alberta Clipper meant another round of fresh powder at Bolton Valley today. While we’ve still yet to get hit by a big synoptic snowstorm in Northern Vermont this season, another Alberta Clipper system came through the area today, and it began delivering a reasonable shot of fresh snow, just like the one last weekend. 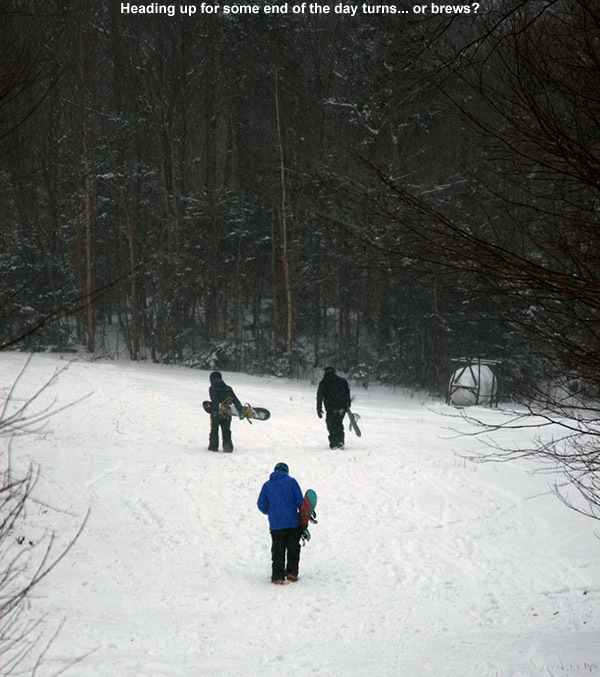 With the snow just starting up this morning, we waited until mid afternoon to head up to the mountain for skiing. By that point we’d picked up a couple of inches down at the house, and the snow was continuing at a good clip. Today also offered to bonus of being a somewhat warm reprieve from the arctic air, with temperatures around 20 F in the valley and up on the mountain at Bolton Valley. I dropped E and the boys off at Snowflake, parked the car, and got my gear together fast enough to catch them on their second run. Ty was raving about the snow on Butterscotch in general, but E didn’t quite find the overall setup quite as nice as what we found on Monday. 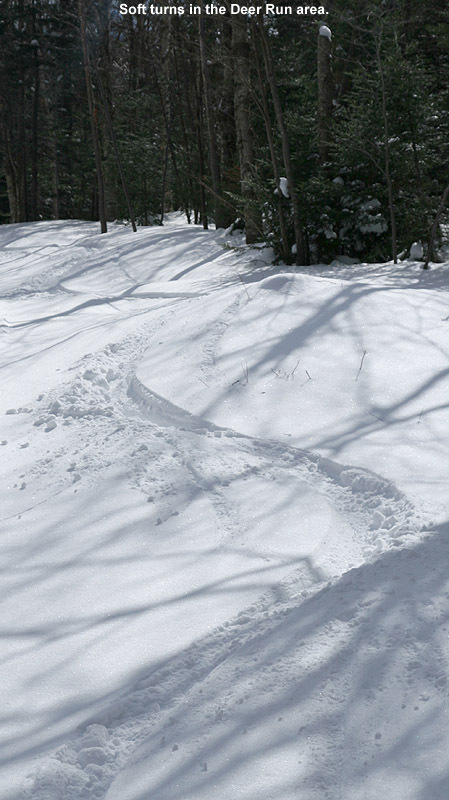 She said that the middle of the trail was good with the new snow, but the powder on the skier’s right didn’t cover and even out the subsurface in quite the same way that it had last time. Those subtleties aside, you could tell that there been another nice addition to the snowpack, and the snow from this storm was definitely denser than what we received on Monday. In fact, although it was still fairly dry at ~7% H2O according to my analyses from down our house, that’s still roughly twice as dense as the last storm. The snow certainly had some heft that helped cover up the old surfaces, but it wasn’t going to be flying in your face the way the snow from the last storm did. Heading next to the Vista Quad, we took Spillway, finding some good turns, but again a notch below what we’d found on Monday. Ty worked the terrain with fresh snow off to the skier’s right, but wasn’t interested in setting up any photos; clearly the snow couldn’t quite inspire him the way the last storm did. E wasn’t feeling comfortable enough on her Teles today to stick tight to the soft snow on the edge of Spillway, so spending more time toward the middle of the trail, she had to deal with some icy, high-traffic spots. As we descended toward Mid Mountain, the boys toured us through some nooks and crannies of access roads in order to ski under a big bent over tree. That was a bit of a slow route, but you could get a feel for just how much snow was starting to build on the natural terrain. We checked out Beech Seal on the lower mountain – I hit the usual soft snow on the skier’s right and found it performing right in line with the other terrain we’d skied. The skiing was great, just a notch below the last storm. I hadn’t seen where Ty had gone on Beech Seal, but it turns out he’d snuck over into the little lane of terrain on the right beyond the racing fence. He gets a kick out of being over there, and of course he’s probably one of the only people who can comfortably fit in there and loves the fact that the powder is untouched. 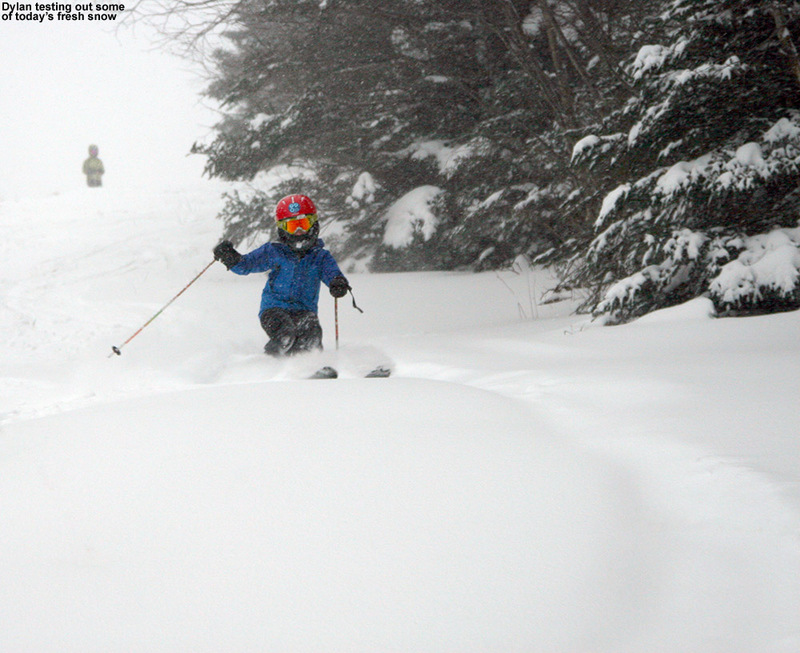 With Swing finally open, we next headed over toward Wilderness to sample some of the powder over there. Checking on the powder depth at 2,775’ on Lower Crossover like I’d done on Monday, I got a reading of 9 inches. That’s actually an inch lower than what I recorded on Monday, but that’s not surprising after several days of settling and now some denser snow on top. Most importantly, the net content of liquid in the snowpack has increased again with this storm. 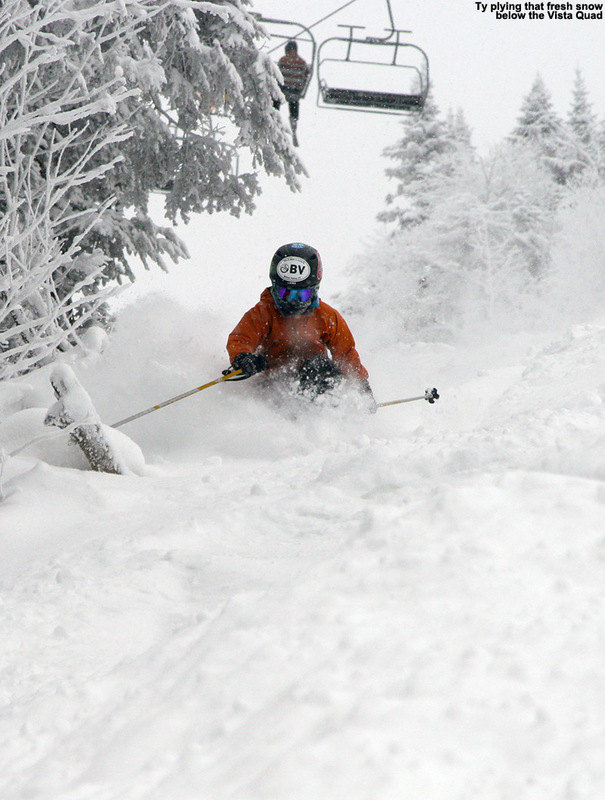 Every storm continues to bolster the snowpack over there, and we definitely had our best run of the year on Turnpike. It’s really been our go-to trail this season when snow has been lean, and it was just a heck of a lot of fun with all the new powder. Ty later told me that he was working on his body positioning in the air with this jump – nice! Although we still had daylight, the night skiing lights continued to come on as the resort shifted into night skiing mode. 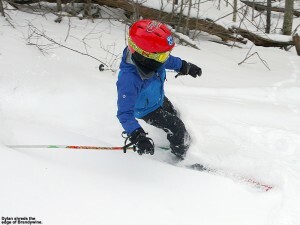 It was 4:15 PM, and I had to be in Burlington for dinner, but we decided to catch a final run off the Mid Mountain Chair – Ty really wanted another chance to ski his line behind the racing fence on Beech Seal. The snow continued to pour down, now with some larger flakes more reminiscent of upslope, and as we skied along I commented to E on how conditions were almost of the type we like for night skiing – fresh snow, no wind, and relatively warm. For those that went out last night to the slopes, I’d say they chose a good one. Ty got to ski his line, and Dylan followed along as well, continuing on to the second fence where the line ends in a bunch of brush. Dylan extricated himself easily though, and came out smiling. We skied right back down to the access road through the trees near the Wentworth Condos, which is always a nice way to end the day. I’d say the mountain had picked up at least 2 to 4 inches by the time we’d left, and a half foot would be a reasonable way to expect the event to finish off. We’ve got a chance for another Alberta Clipper on Monday, and a steady diet of these is certainly a nice way to go until a bigger storm comes through to really give us a big jump in base depths. 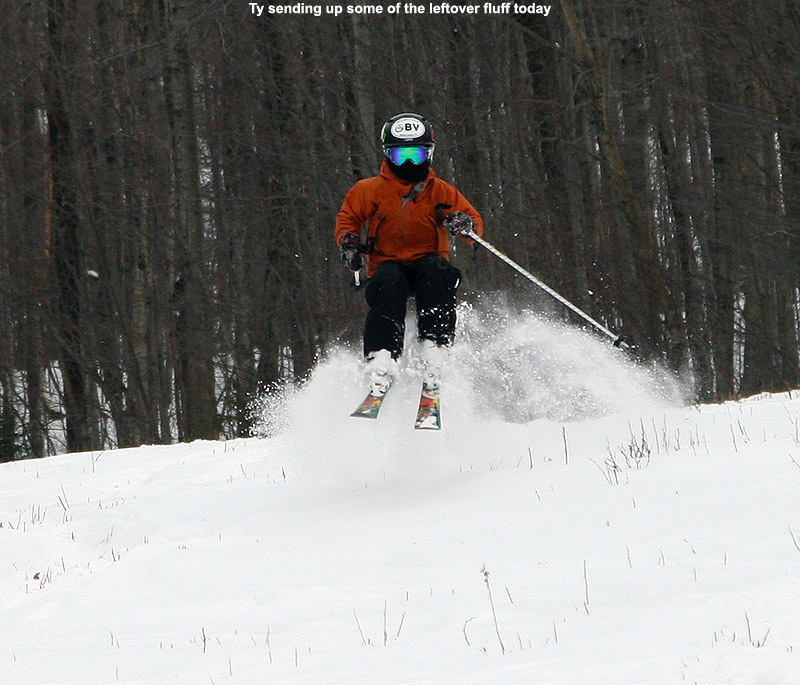 It’s amazing what a little of that Champlain Powder can do for the skiing. When Bolton Valley reported another four inches of snow this morning, we knew that we’d be heading up to make some turns. That amount of snow, on top of the four to five inches that I’d found when I visited the mountain yesterday, was definitely going to bring the skiing up a notch. As it turned out, it brought the skiing up several notches and turned it into what was for us, unquestionably the best ski day of the 2014 calendar year. 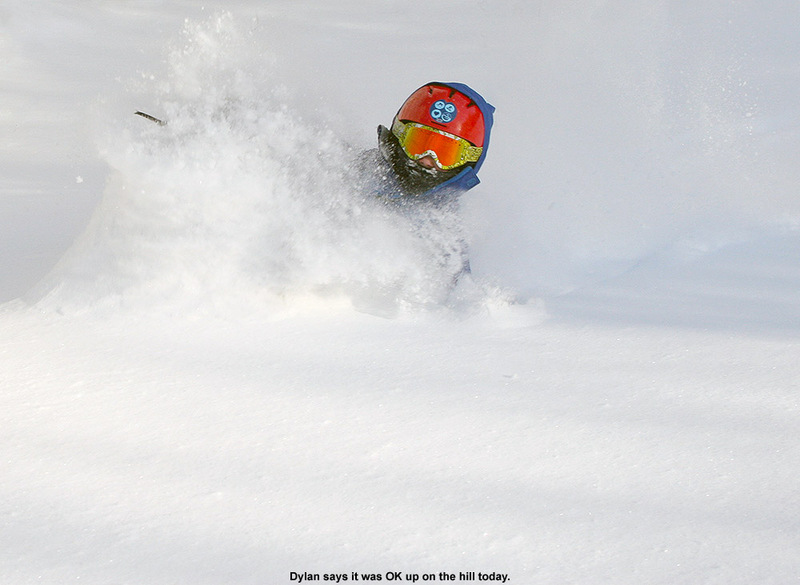 That’s actually not saying much with the way the past few weeks had gone in terms of weather around here, but when Ty gets talking about having to ski blind because there’s too much powder in his face, it’s a sign that conditions are on the mend. The approach of an arctic front brought an inch and a half of snow to the house overnight, but as the cold air continued to filter in, more snow was wrung out, and we received snowfall of various intensities through the morning. 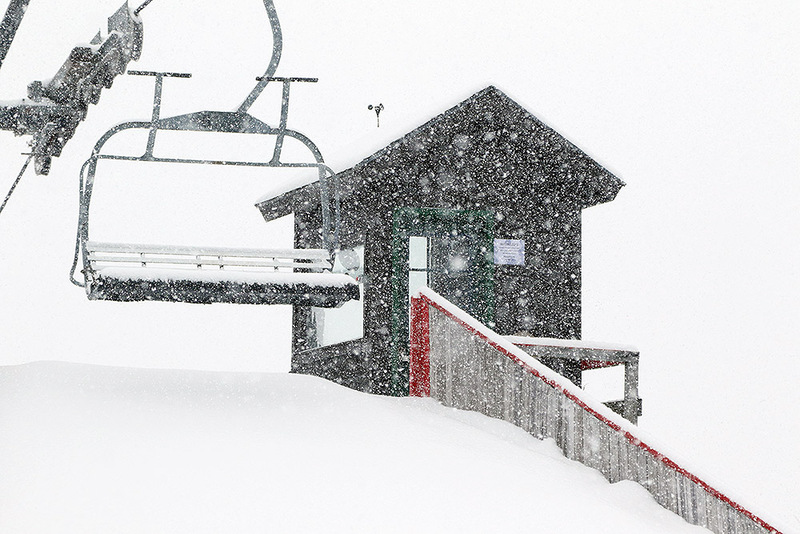 Snow was falling up at the mountain as well, and with updates on the website indicating that new trails were opening, it sounded like conditions were getting better and better. While we had initially started to discuss both skinning and lift-served options for today’s outing, the opening of new terrain sealed the deal in favor of the latter; we knew that meant that the recent accumulations had resulted in substantial changes in coverage. In the end, with so many additional terrain options opening, it was clearly the right choice. We finally headed up later in the morning to find the parking lot only about half filled, and after dropping E and the boys off at the base of the Snowflake Chair, I quickly got a great spot to park down near the end of one of the top rows with help from one of the parking attendants. I’d spoken with him before, and as I got my gear on, we chatted about how nice it was to have some consistent temperatures back – the past few weeks have been a real roller coaster with systems passing though off to the west, and he said that he had to pack a ridiculous amount of clothes each day just to keep up with the weather. 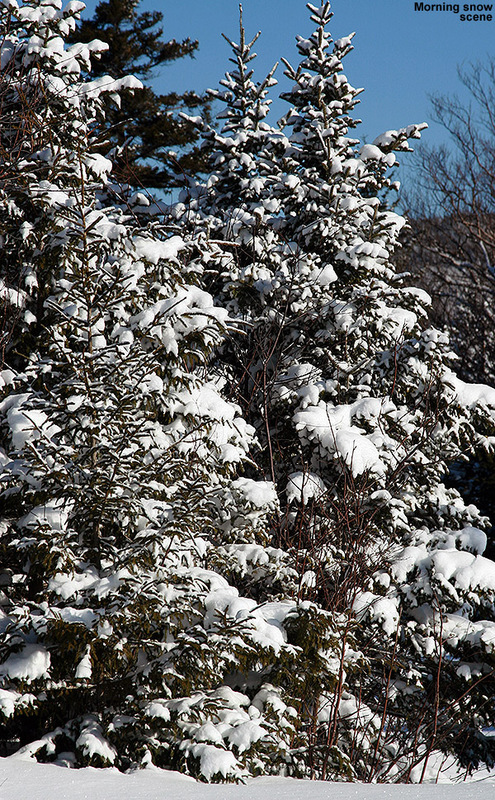 In any event, winter was definitely in place, and as I look around at the falling snow and ski vehicles covered in white, it was a much more familiar look for the Northern Greens in winter. By the time I got to the base of Snowflake, E and the boys had already completed a couple of runs, and Ty was raving about the conditions. 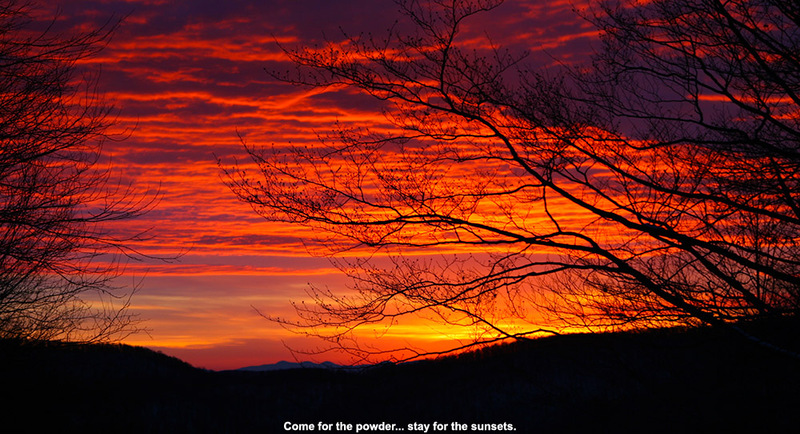 They’d taken Butterscotch, and Ty said that there was powder off to the sides, but even if you didn’t go into the powder, the conditions were great. We hit one more run there, and then boarded the Vista Quad to hit some steeper terrain. We spent the midday hours trying out the steepest available terrain like Spillway, Hard Luck, and then Alta Vista. Not surprisingly, there were some firm surfaces on the middle areas of the trails where manmade snow predominated, but off to the sides where traffic was low, the snow was generally softer and there was plenty of chopped up powder and even untracked powder at times. 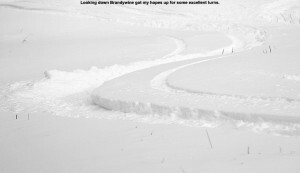 The skier’s right of Spillway held a lot of great snow over the edge of the trail where the terrain fell away. 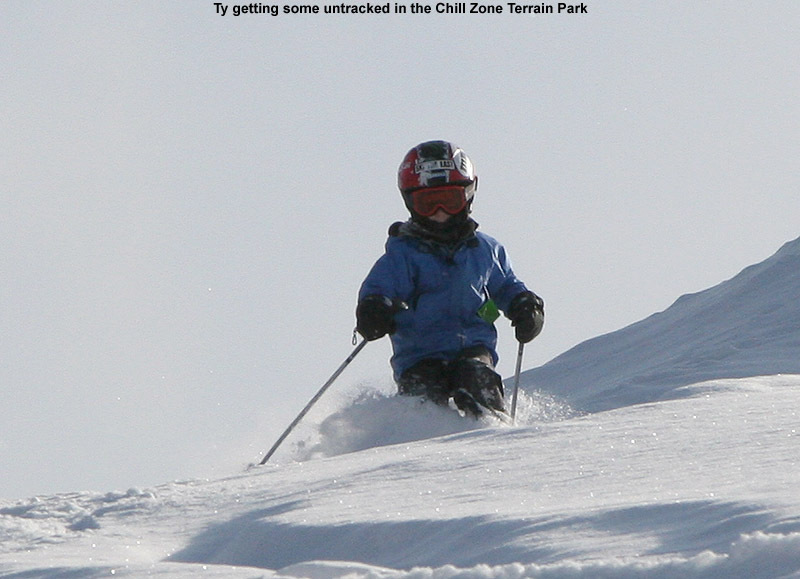 Ty finally getting his chance to ski some of Bolton’s steeper terrain on the great snow today. After a few runs, E was getting a bit cold, and Dylan was ready for a break, but Ty was just too jazzed to go in. He wanted to stay out with me and shoot some photos, so I told him that I had two specific runs in mind. We kicked things off with a run down Spillway, where he dissected all the potential powdery lines off to the skier’s right, coming up with his own lines and photos that he wanted me to shoot. He was one fire on that steep terrain, taking on everything, even the occasional massive death cookie that got sent that way from the groomers. On our next run we headed over toward Wilderness. Although Swing was roped off, closing the upper entrances, another track was available off Sherman’s that gave us some lower access. 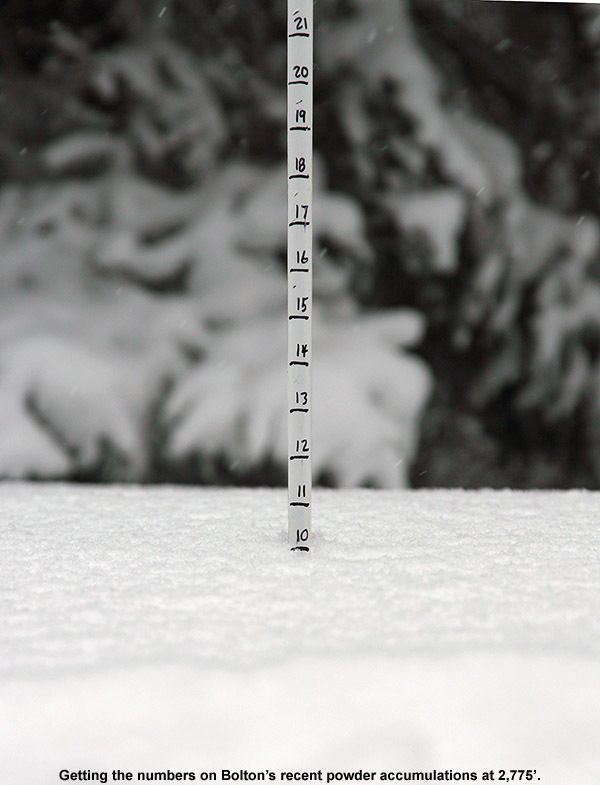 I checked the snow depth as we headed over, and found 10 inches of settled powder. The Wilderness Lift Line was in nice shape with plenty of coverage and plenty of powder, and Ty managed some nice face shots. Ty encountering some of today’s visual impairment. We stopped in the lodge for some lunch with E and Dylan, and then brought Dylan out for one more run in the powder on Wilderness. They boys got some deep turns on Cougar, followed by a delightful cruise through the powder on Turnpike. Actually, we had to use the tracks of others at times on Turnpike, because the powder is now getting almost too deep for some of the pitches there. The snow had let up, and the sun came out for that final run to really punctuate the day. The coming week is looking quite cold, with single digits for high temperatures, but at least the snow is going to be well preserved for the near future. 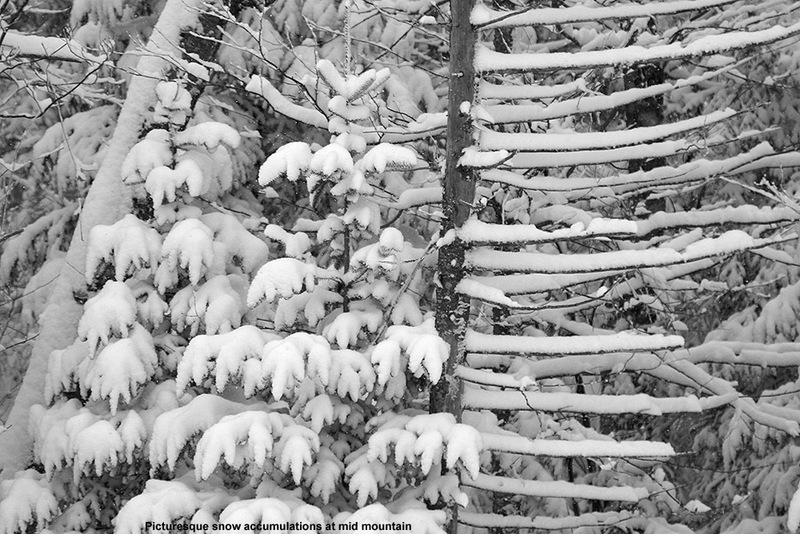 It was interesting to note what Powderfreak said in the Ski Tread at American Weather – that this week we just managed for the first time in 2014 to have an average snowfall week here in the Northern Greens. With that being the case, an above average week should be really fun. 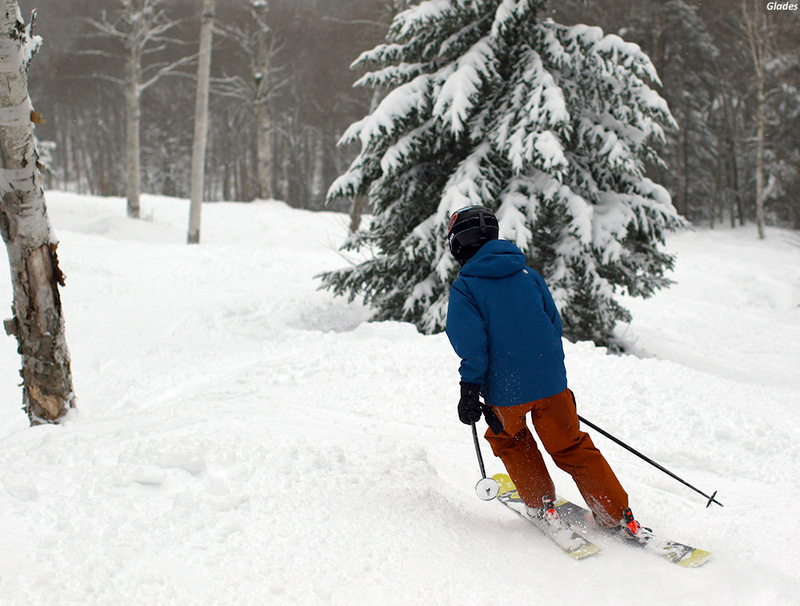 A couple of modest storms have helped replenish the powder at Bolton Valley over the past few days, and there could be more on the way tonight. 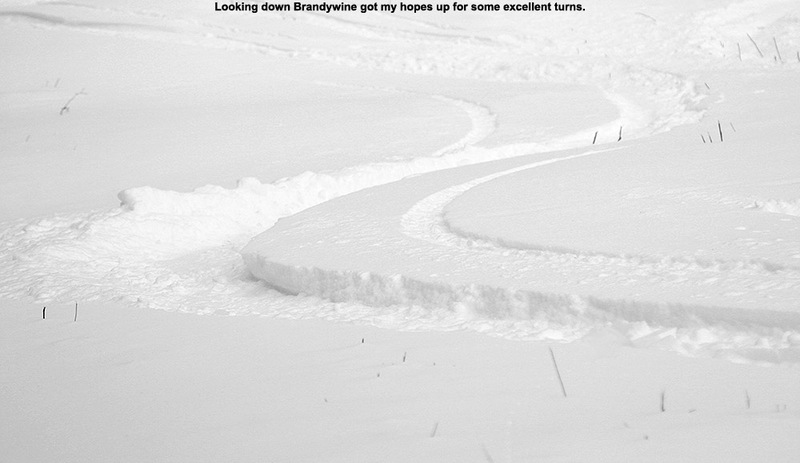 It’s been two weeks since I was last out on the slopes, because there hasn’t been much to draw me out in the interim. 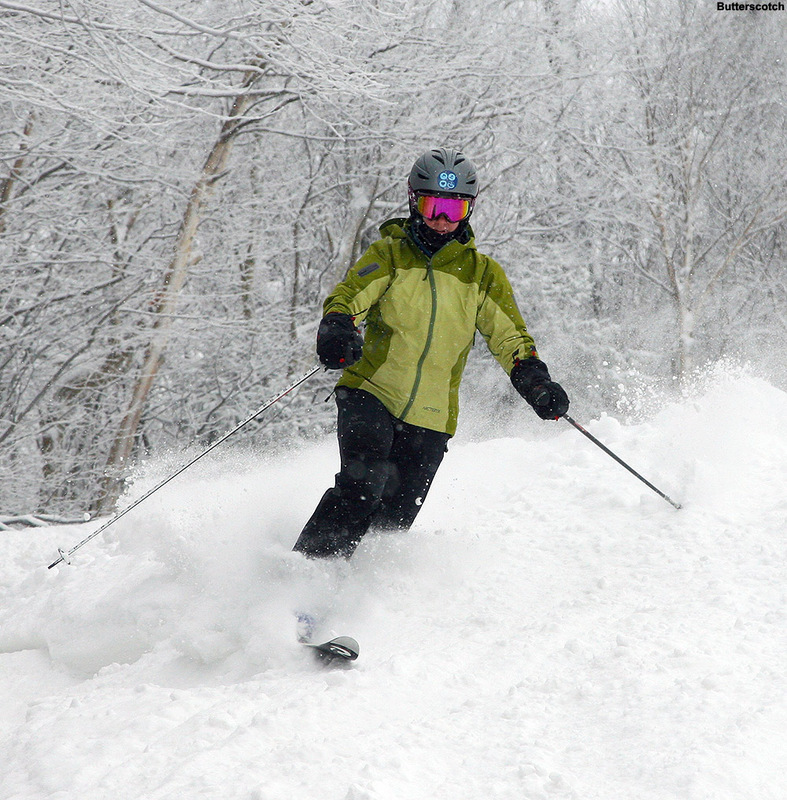 We finally got a small snowstorm on Wednesday though, and with another few inches of snow at the mountain overnight into this morning, it seemed like it was time to check out how the powder was building up. Actually, the potential exists for a few more inches of snow tonight with the passage of an arctic frontal boundary, so my real goal was to make a reconnaissance run to see how the snow might be set up for tomorrow. 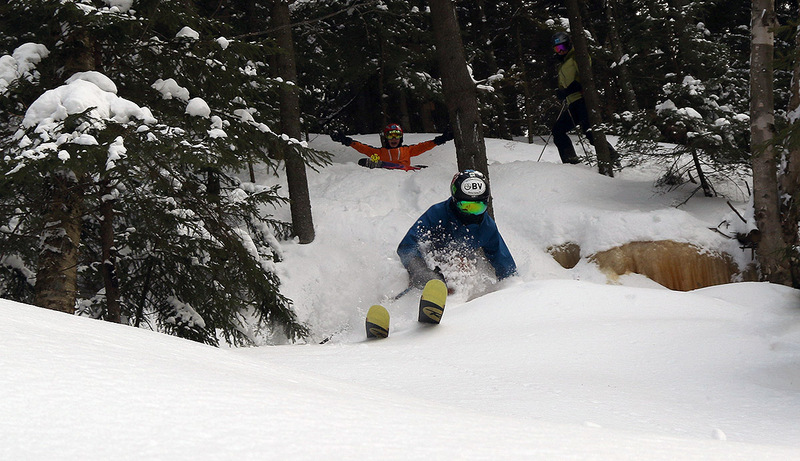 If things come together to offer up some quality turns, it could be time to entice E and the boys up to the hill. After hanging out at home and watching some of the AFC Championship game featuring the Patriots, it was almost 4:00 P.M. before I got headed up to Bolton Valley. I knew that it was going to be getting toward dusk by the time I got on the snow, but I also knew that it would be quite peaceful, and I’ve really been enjoying these tours that I get to finish off while descending to the lights of the Village. Comfortable temperatures in the upper 20s F down at the house in Waterbury, gave way to somewhat chillier temperatures and snowfall as I ascended the Bolton Valley Access Road. Our little system from earlier today had dropped a couple inches at the house, and 2 to 3 up at Bolton, but there had been a snowfall lull during the middle of the day. As evening approached however, snow associated with the upcoming frontal passage was making its presence felt, and as usual, it was starting in the higher elevations. The intensity of the snow increased as I ascended, and the road began to take on a light accumulation of snow at ~1,200’. With no night skiing going on tonight, numerous cars inched their way down the road as they finished off their ski day. I made a brief stop at the Timberline Base to check on the snow situation at 1,500’, and indeed as expected, I found that the snowpack is still a bit too lean down at that elevation to be supporting comfortable skiing without rock skis or junkboards. 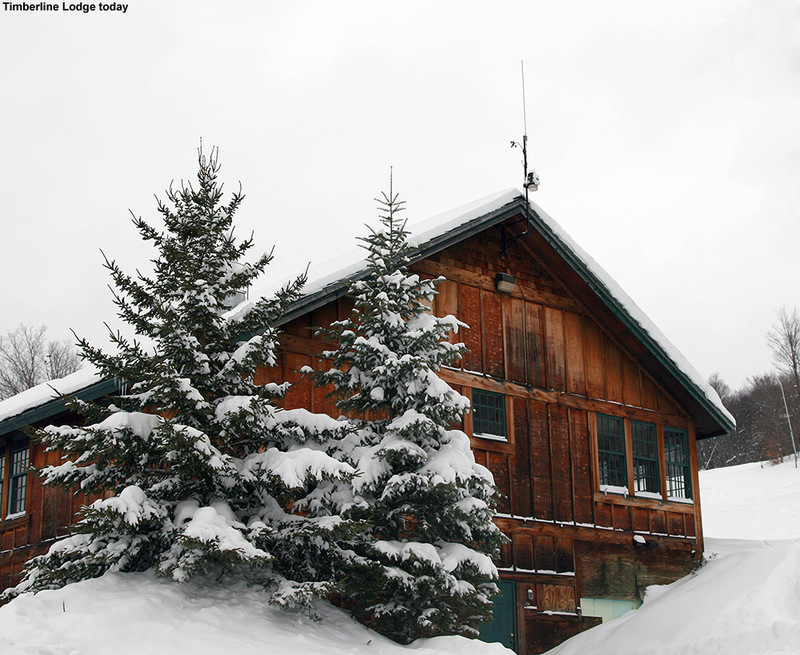 There was only 1 to 2 inches of powder down at the base lodge, and that was on top of a fairly thin base. The snowpack was much improved up in the Village at 2,100’ though, where there was a decent base of several inches, and a consistent 4 inches of powder. I geared up and began my ascent of Turnpike, watching three snowboarders ahead of me that appeared to have similar thoughts. In a couple of minutes however, they stopped along the trail just after the junction of Turnpike and Wilderness Lift Line, cracked open some beers, and kicked back in the snow. Good times. 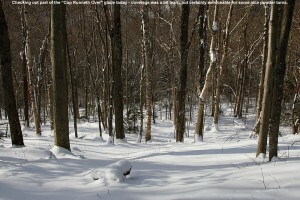 We exchanged greetings as I passed, tossing around comments on the joys of the new snow, and I continued upward. There was a nice skin track at times, although it did get disrupted as ski tracks merged and diverged from it, or the end of the occasional deeper water bar forced it away from the trail’s edge. Steady light snowfall continued, and an occasional gust of wind worked its way into the protected confines of the trial. Being a trial run, and paying some respect to the growing darkness, a decided to stop at the connector between Turnpike and the Wilderness Lift Line around 2,500’. The depth of the powder had increased just a bit by that point, and measurements were in the 4 to 5-inch range. There was some untracked snow still remaining on Turnpike, but despite being a bit more exposed to winds, the Wilderness Lift Line had seen a lot less traffic and seemed like the way to go for fresh tracks. There were some tracked areas off to the left and right, but excellent lanes of powder showed themselves near the middle of the trail, even in the darkened view allowed by my goggles. The turns, as I’d later describe them to E, were what I’d call “par for the course” for that area over the past few weeks. The snow wasn’t overly deep with just 4 to 5 inches, but the pitches fit that depth quite well, the turns were mostly bottomless on the fat skis, and it was some damn fine powder skiing. The only complaint would be that the snow was a little cold and slow in spots, so maybe an extra coat of wax would be in order if we try something similar tomorrow. There were no signs of the snowboarders by the time I reached the bottom of my run, but the Village was abuzz with lights, and televisions that were probably set to the Patriots game. 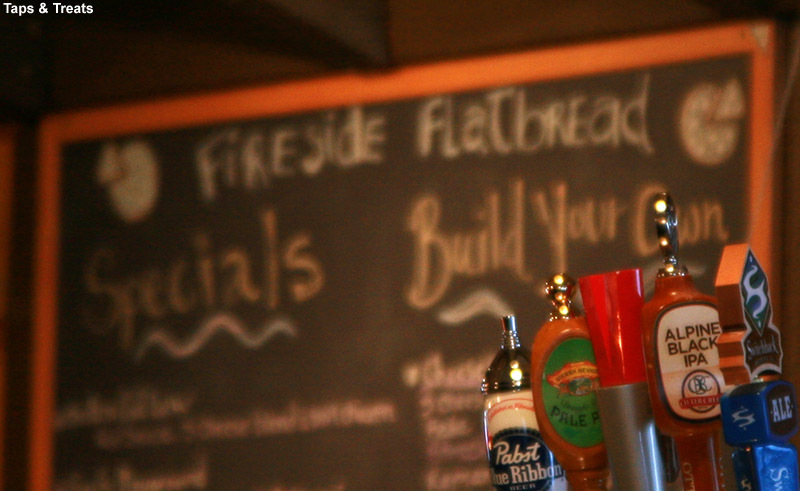 I stopped in for a few minutes at the big screen set up next to Fireside Flatbread in the lodge, and it wasn’t looking good for the Patriots – the Broncos were up 20 to 3. Outside, the snow had redoubled its efforts, and was coming down at a moderate pace. 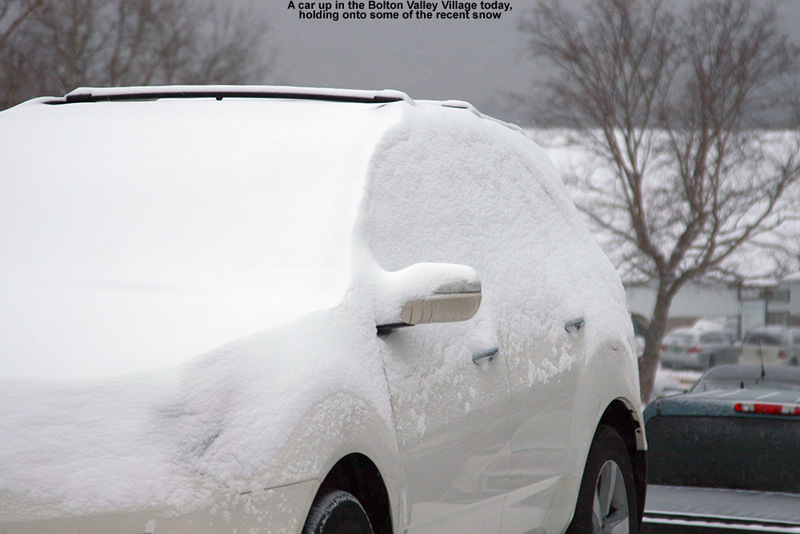 I had to take some time to wipe the snow off the car, as there was a good coating on the leeward sides. Snowfall that was initially more minimal down here at the house has picked up as the evening has progressed, so we’ll have to see where things stand tomorrow with the new snow. 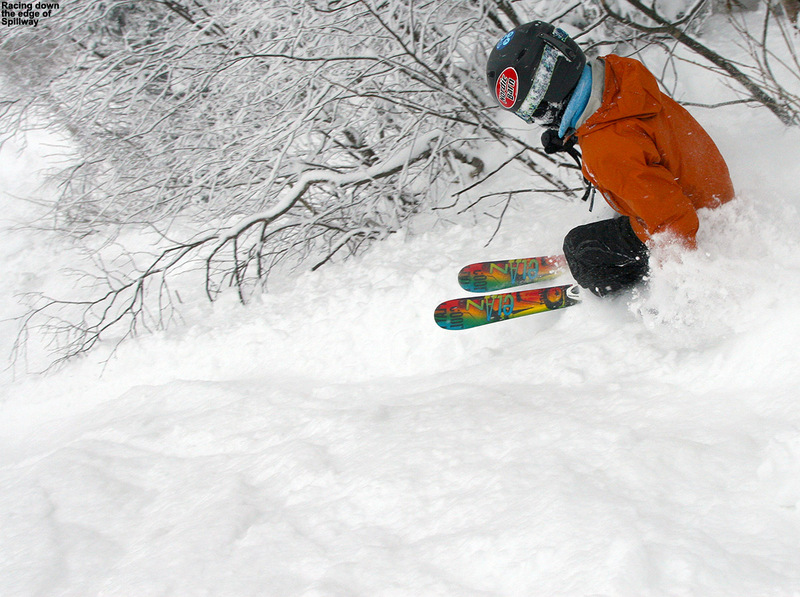 Winter, and fortunately powder skiing, is certainly back after its earlier hiatus. Although I never made it up to the main mountain yesterday, the skiing I found at Timberline was quite good, and suggested that the snow would be even better at higher elevations. That snow, combined with the continued moderating temperatures expected to rise through the 20s F into the 30s was a recipe for some very nice skiing. The forecast has been predicting these conditions for a while, and E and the boys were on board for getting up to the mountain today as well. I’d told E about yesterday’s turns, so we had to decide if we wanted to go for some of that powder at Timberline, or ride the lifts and ski at the main mountain. 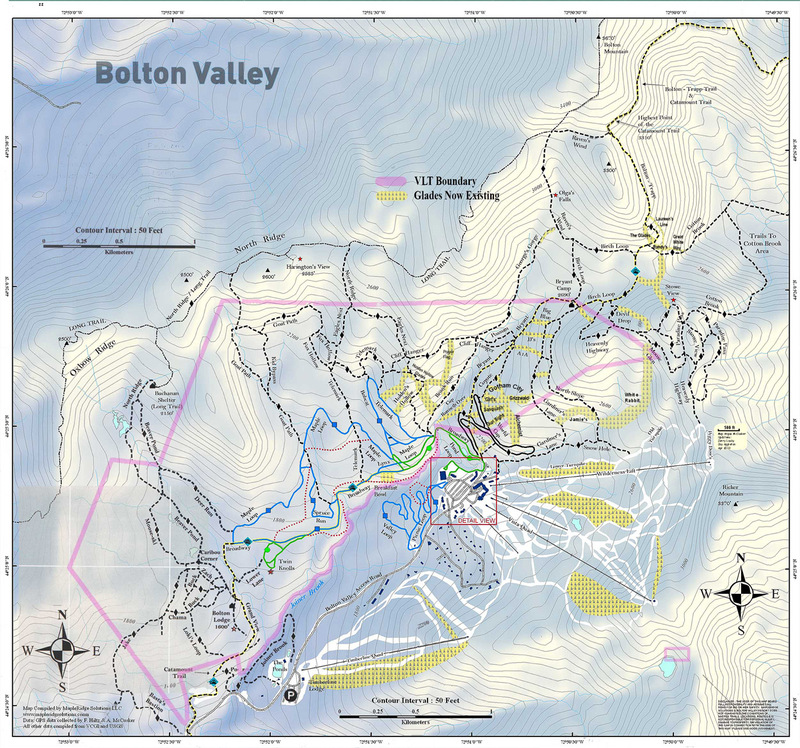 We decided that it would be good for the boys to get in some lift-served skiing at Bolton Valley, since they’ve yet to do that at all this season. We also realized that we could still work in some Timberline powder if we spotted a car at the Timberline Base, and that would get the boys a little of everything. 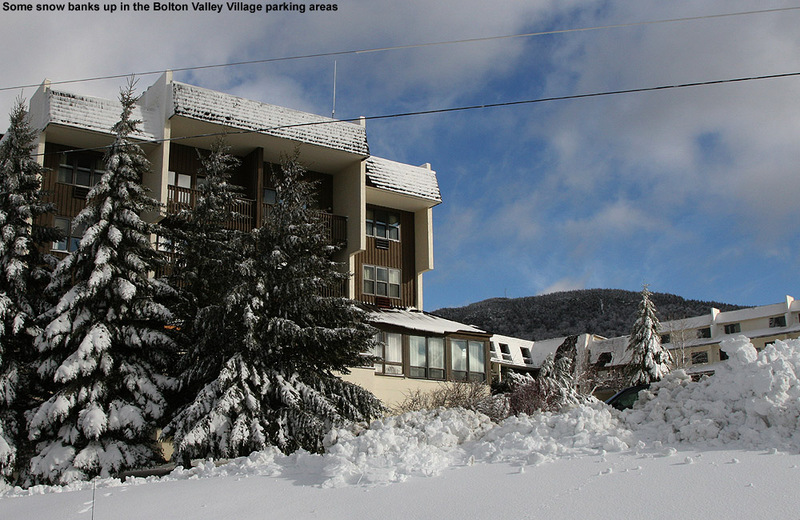 When I was checking out the Bolton Valley website yesterday evening, I noticed that they were having a special promotion today – it was the first of four Subaru/Hyundai days in which owners of those vehicle brands could get a free lift ticket for the afternoon. Also, additional guests could get tickets at 50% off. I wouldn’t have been more than a passing thought, except that E was thinking of getting out with Gabe, one of our BJAMS students, to let him practice snowboarding before our regular season program begins at Stowe next week. I told E about the promotion this morning, and although it turned out that she didn’t get together with Gabe, we had another potential student that could use a ticket. E was planning to get together with Claire to work out the ski groups for the ski program, and during their planning, they realized that Luc could come and ski with us using a free ticket. Claire dropped of Luc with plans to meet with E again later, and we headed up to the mountain. Heading up the access road, it was right as we approached the Timberline area that we realized our day was going to be a bit different than we’d expected. The sign was already up indicating that the upper parking lots were full, and that meant that there were a lot of visitors at the mountain today. Although we could probably have found a spot up in the Village lots from people that were leaving, we decided to park the cars at the Timberline Base, since we’d already been planning to end up down there anyway. It was about three runs of the shuttle before we were able to get on, but once we did, the boys loved it since it was their first opportunity to ride the Bolton Valley shuttle bus. 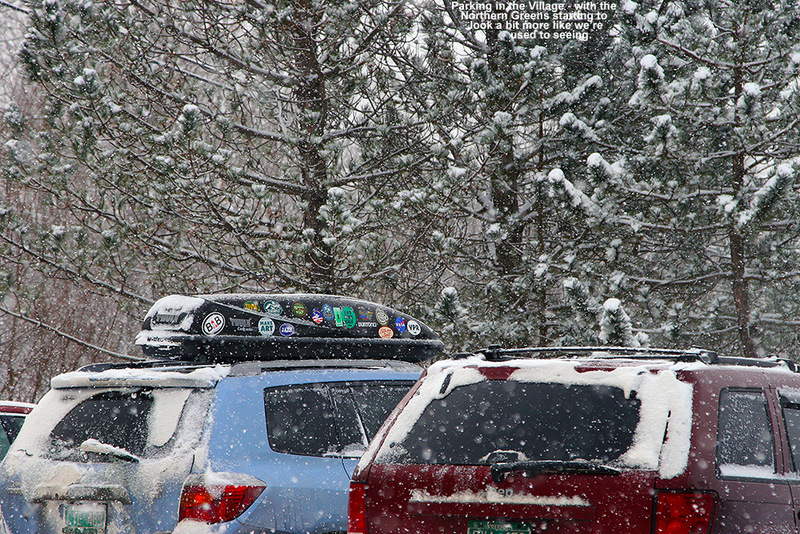 As if the need to initiate parking down at Timberline hadn’t been enough of a signal, at the base area, it was immediately obvious that the Subaru/Hyundai promotion was a hit. I guess when half the state owns Subarus, you’re going to get a response to such a promotion. The lift queue at the Vista Quad was quite long, and had to be at least 10 minutes. We decided to take a run on Snowflake, since the queue wasn’t too long, and the snow on the Butterscotch slope looked quite good. Indeed the snow was quite good, with some powder off to the edges, but it was just too short a run to be waiting 5 to 10 minutes to ski it, so we decided to make the next run down to Timberline. From my Timberline explorations yesterday, I knew that there would be plenty of decent skiing even if we just followed out the Timberline Lane traverse to Brandywine, so that’s what we did. When we got there it was immediately obvious that there were more tracks than yesterday, so it was more challenging to find fresh snow. 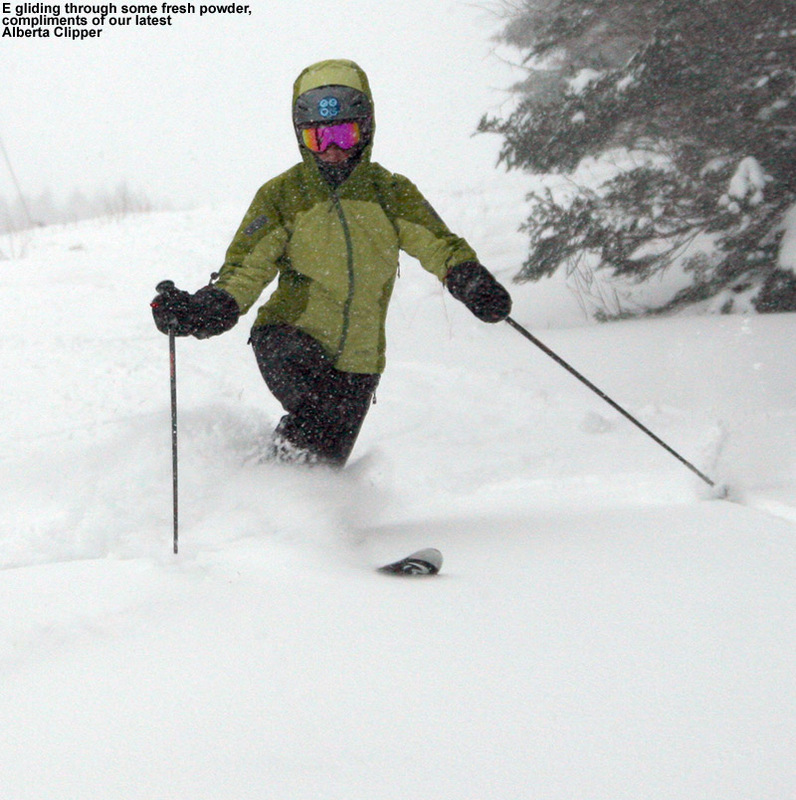 Also, folks were finding the skiing a bit tricky, due to the snow composition and coverage. I have to admit, I could really tell the difference between being on my mid-fats today, and being on my fat skis yesterday. Typically that difference in powder performance is more subtle, but not today – the fat skis had kept me that little bit higher in the snow yesterday, and that meant minimal interaction with the base or any crust that was sandwiched in between the layers of powder. Also, with the areas of untracked snow not as vast as yesterday, it limited line choice. Although the conditions were a bit challenging for E and the boys at times, there were still a lot of great sections of powder, so great turns were made. Even without getting in on the biggest accumulations, the Northern Greens have been doing their thing to the best of their ability. Back down at the cars, it was mid afternoon, and the combination of lift queues and conditions on Timberline that while OK, certainly didn’t have E and the boys raring to go for more, and that made it an easy decision to just call it a day. We headed back to the house where E and Claire spent some time working out all the groups for the ski program. I’m not sure how many extra tickets were sold today for the promotion, but it certainly brought people out. The fact that it was a nice mild day after the recent cold weather probably played into it as well. Hopefully they can have some of the other main lifts open for the next one of these promotional days, because that wouldn’t put so much pressure on the Vista Quad. With the base snow that is out there, all that’s needed is one good synoptic snowstorm to hit the area without going too far south or north and most terrain would be able to open. 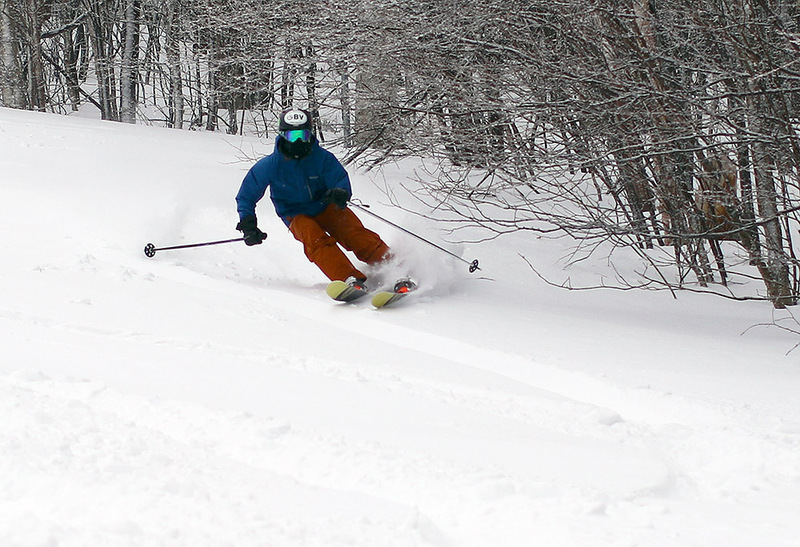 Despite only modest storms over the past week, the snow has definitely built up for some nice powder skiing. 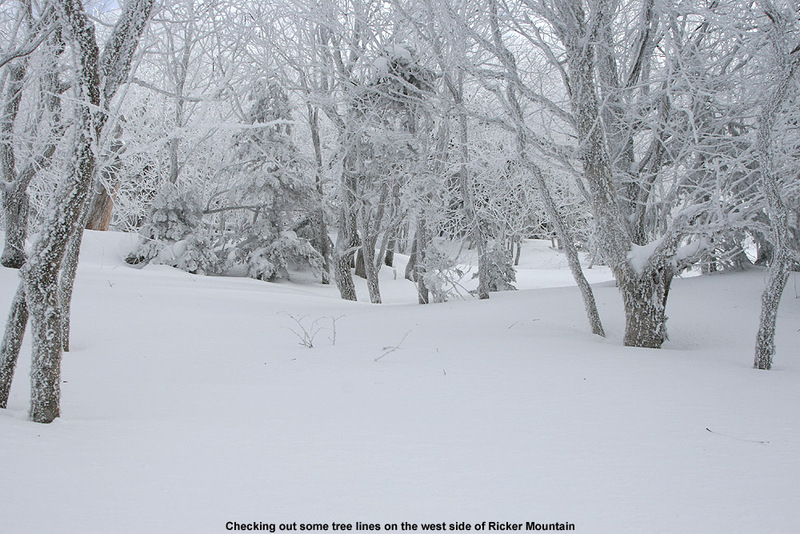 Our weather pattern in the Northeast has been fairly active over the past week, with four storms affecting our area since December 28th when I was last out on the slopes of Bolton Valley. For Northern Vermont, these storms really haven’t been big hits though. 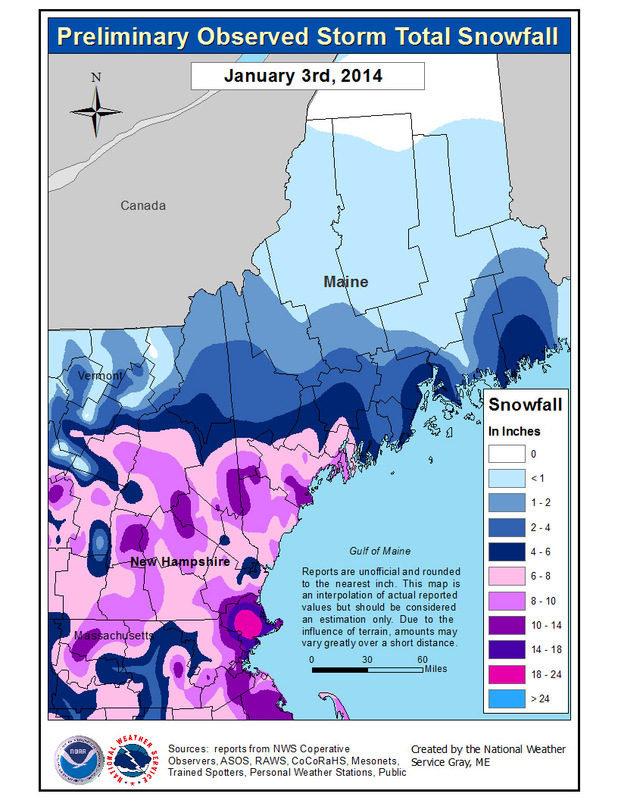 The first storm on the 29th was one that really hit Central Vermont and New Hampshire, and areas off to the east in Maine, while areas to the north and south of that saw little if any snow. 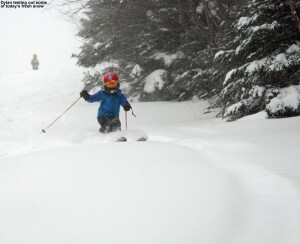 In general, the ski resorts in the southern 2/3 of Vermont picked up the snow, with Okemo topping the list at 10 inches. The second event was just a little cold temperature diamond dust that fell from a weak short wave system through the midday hours on New Year’s Eve. Third in line was a weak Alberta Clipper system that brought a couple of inches to the northern valleys and mountains, and the fourth was the big kahuna… at least for some areas. It was a coastal storm that was pretty far off shore, so again it was southern areas that picked up the largest snow totals. 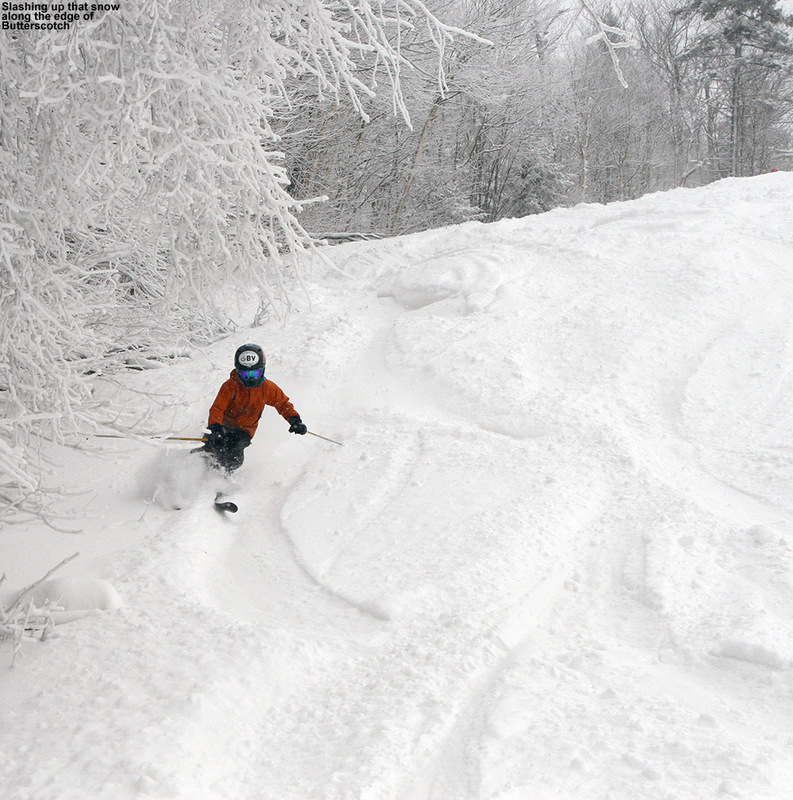 For the Vermont ski resorts, Stratton topped the list with 18 inches, although there were places to the north of Boston that picked up two feet. 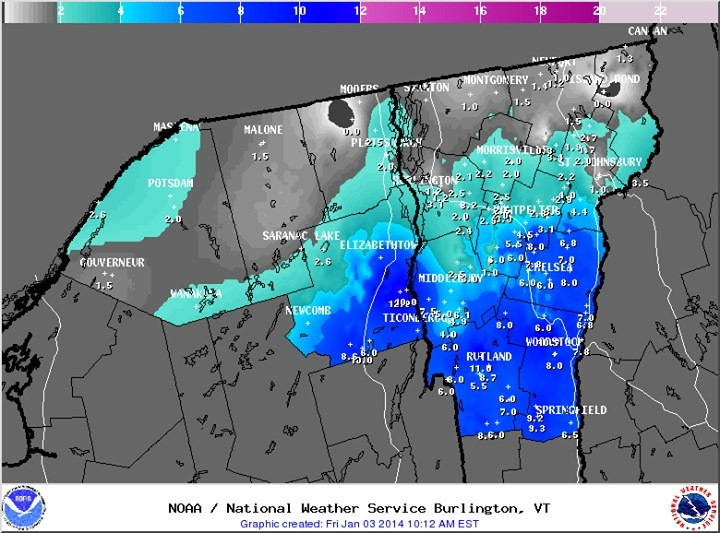 In terms of Northern Vermont it was again a fairly minimal storm, but the few inches that fell were quite dense. Here at the house we picked up 3 inches of snow, but it contained almost a third of an inch of liquid. 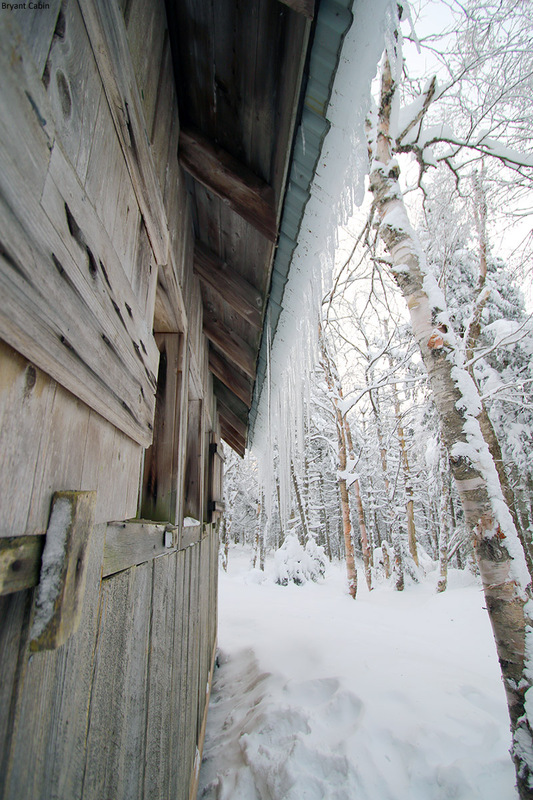 One notable aspect of that storm was how cold it was – it was snowing significantly with temperatures in the single digits and even below zero Fahrenheit. 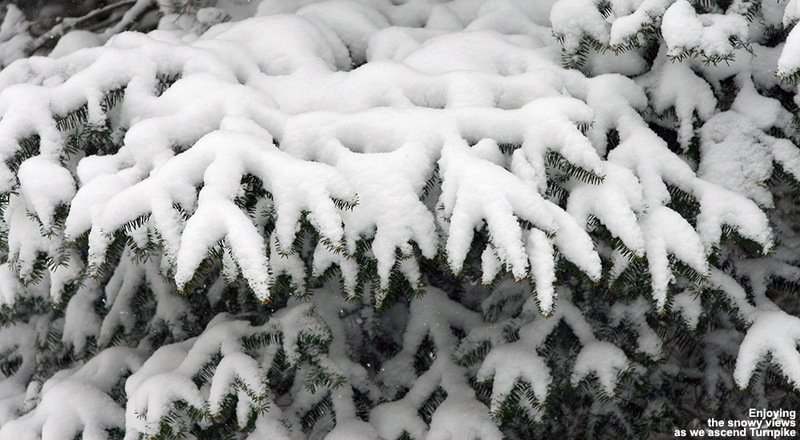 That was part of what made the snow up here so dense – it was actually too cold for optimal dendritic snowflake production. Despite the recent additions of snow, there hasn’t been too much incentive to ski over the past couple of days, basically because of the continuation of those cold temperatures. When the high temperatures are below zero Fahrenheit, as they have been in some locations this week, I’d much rather get other work done and save skiing for when the temperatures become more respectable. Fortunately, today was that day. Temperatures climbed into the low 20s F this afternoon, and since I was curious about how those rounds of snow over the past week had settled in up at the mountain, it was time to check it out. I really didn’t know what to expect up on the hill. New trails have been opening up on natural snow, including some black diamond runs like Schuss and Vermont 200, so that seemed like a good sign. 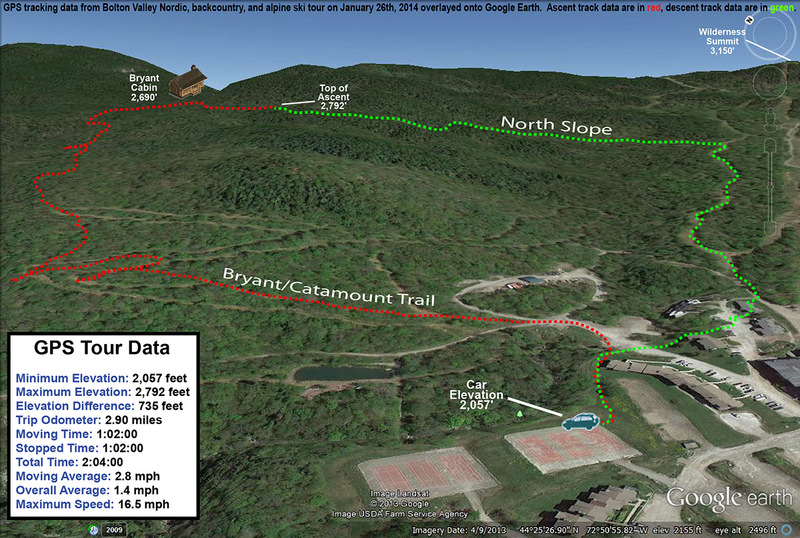 I was also curious about the lower-elevations on Timberline though. If the recent snows had put down enough coverage there, I was excited to skin up for some powder turns. To cover my options, I put both the fats and mid fats on the ski rack, and threw their skins in the back of the car. I was ready for whatever was out there. First on my list was to check out Timberline on my way up to the main base, but that’s as far as I got. There was still some tall grass sticking out of the snow on the slopes, but I could see a lot of ski tracks scattered about, and it was clearly game on for Timberline turns. I grabbed the fats, put on the skins, and headed up. There was a well-established skin track heading up the usual Twice as Nice route, so clearly a lot of people have been earning turns since the most recent storm. At the base elevations down at ~1,500’, the snowpack had a few different layers. Going from the top down there were 3 to 4 inches of powder, with what appeared to be a thin crust below it, then another inch of powder, and then some denser snow. All told it was only about 5 to 6 inches in deep, but there was enough substance to it that it seemed like it would provide some decent skiing. Up above 2,000’ it was notably deeper, with more base and a snowpack hitting the 7-10” range. Based on what I’d seen in the lower elevations, I thought that Brandywine might be a nice option, so I headed to the top of Intro and switched over for the descent there. Looking down Brandywine, the signs were definitely positive. The trail had seen a few skiers, but there was plenty of untracked snow on the skier’s left, and based on the tracks it looked like there would be plenty of cover. 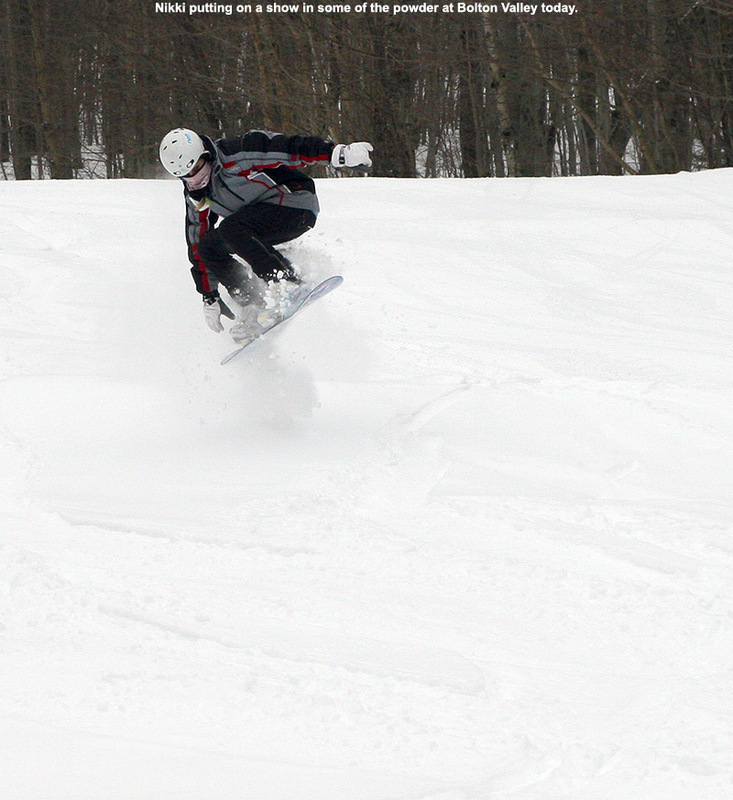 The turns were even better than I’d expected, with 6 to 8 inches of powder over a hardened base up top. There was that thin layer of crust sandwiched in there somewhere, but it only occasionally made its presence felt, and the fat skis made quick work of it. One of my favorite parts of the descent was playing in the dips and rolls along the skier’s left of the trail – there was some incredible flow and the fats had that “no width” feeling much of the time. There has definitely been some good snow building up on the mountain while I wasn’t looking – it’s certainly not enough to support lift-served traffic yet, but we’re just one good synoptic storm away from that with the base that’s down there now. When I reached the junction with Timberline Run I saw that it was rutted from snowcat traffic, so I took Spur, which was totally untracked. 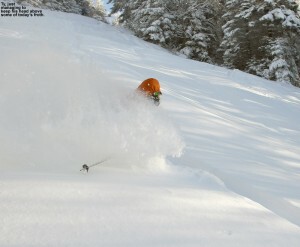 The powder wasn’t so deep that I couldn’t move on the modest pitches, but it was enough to keep you floating for turns. As I passed by Spell Binder I saw that there had been a lot of skier traffic there, so indeed people have been hitting it hard. 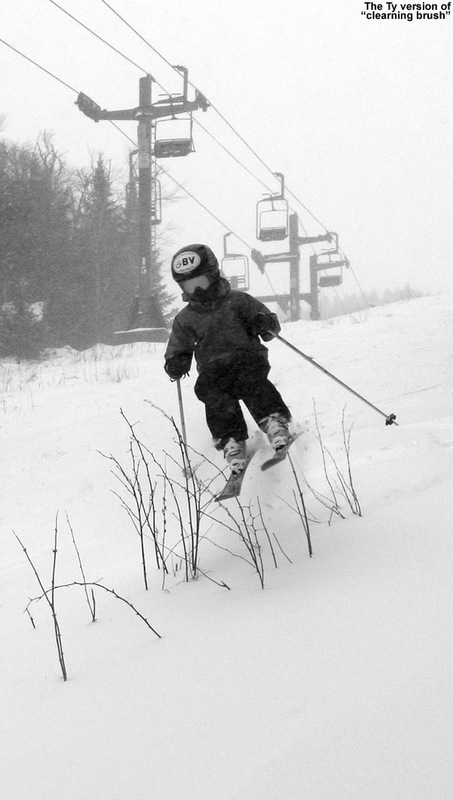 It seems like there was a mini army out there skiing laps over the past couple of days. Just as I was reaching the end of Spur, I saw that the sky was exploding with color off to the west, and it quickly became dramatic enough that I had to stop and take it in. I was probably there for 10 minutes watching the color change as the sun sank lower, and I happily got some good photos of the light show. Even the lowest elevations about which I was most concerned offered up good turns, so it may be worth another visit tomorrow. Temperatures are staying mild ahead of the next storm heading this way, so I’d say it’s time get out in the snow in the northern mountains.